"A cat doesn't know what it wants and wants more of it." What time is it on the kitty clock? Think of us as a department store for your cats! If you've been frustrated at the lack of cat products in most pet supply stores, this site was designed for you. Our cat products are grouped by kitty needs. 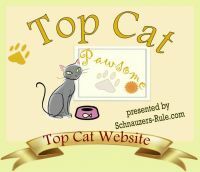 Just scroll down the page to see samplings of all our cat products, broken down by category, or roll your cursor over the menu items on the left side of every page of the site. More specific categories will pop out to the side to show you all the many options we offer. Click on a broader category to see them all, or zero in on just the one you need. You know how those kitties love to nap! It goes back to their wild origins, when they needed to conserve energy for hunting. We carry many things your kitties need for sweet dreams, from beds and perches to sleep aids. Click the photo above to shop all our Cat Beds & Accessories. Why does my cat freak out? Everybody gets a little stressed. Cats have lots of stressors, from strangers visiting and other cats roaming through the yard outside to minute changes in the home environment. Old Maid Cat Lady has many calming products for kitty. Click the photo at left to shop all our Cat Calming and Soothing Products. Why does my cat always hide? Cats need places to hide and chill. Sometimes all the stimuli around them get overwhelming. There are many cat hidey places we have available. Why is my cat always hacking up hairballs? to help your cat's digestive system process fur balls and stay healthy. Click the photo at left to shop all our Feline Digestive Support products. Why does my cat's ear look dirty inside? to help you care for your cat's ears. How can my cat have diabetes? Click the photo above to shop all our Feline Endocrine Health & Diabetes products. Why do a cat's eyes reflect light? It's to help them see better in low light! Your cat's eyes need delicate care. We offer several products to help you make sure kitty's seeing properly...and looking great, as well! Click the photo at left to shop all our Feline Eye Care products. Why is my cat always scratching? Keep those fleas under control! Banish them from your home...and your cat. Click the photo at left to shop all our Cat Flea & Tick Control products. Meal time is a cat's favorite time on the kitty clock! Many items can help make feeding your cat most pleasant, for both of you. Click the photo at left to shop all our Cat Feeding Supplies. Do I need to groom my cat? Cats do groom themselves, but sometimes they need a little help. Yes, your cat is the most beautiful of all. Keep him that way with the right grooming tools. We offer several options for this. Click the photo at left to shop all our Cat Grooming Products. Can I treat my cat at home for...? Always see your vet when you must, but many cat issues can be handled at home. Learn which ones with books on cat care and proper health maintenance. Click the photo at left to shop all our Cat Health Reference Books. Just like us, our cats need proper hydration. But they're cats, so they're picky about the water they drink. Encourage healthy drinking with the right bowls and fountains. Click the photo at left to shop all our Feline Hydration Supplies. You'd never realize it from some of their crazy sleeping positions, but our aging kitties get a touch of what old-timers call rheumatism, too. Help yours with joint supplements and assistance. Click the photo at left to shop all our Cat Joint Support products. Can cats be trained to use a toilet? Aren't you glad you don't have to take your cat out for a walk on a blustery day? Now, properly provide for kitty's potty needs so you don't have to clean out your shoes. Click the photo at left to shop all our Potty Time products. Can you brush a cat's teeth? Mom, I need my own toothbrush! Take care of your cat's teeth and gums, and you're adding years onto her life. Click the photo at left to shop all our Cat Oral Health products. Why is my cat always on top of the refrigerator? If your cat keeps perching on your head, maybe he's trying to tell you something. Cats need high places to feel safe and observe their surroundings. Click the photo at left to shop all our Cat Perches and Shelves. Your cat may enjoy the outdoors, but it's filled with dangers. Keep kitty safe, indoors or out, with a secure enclosure! Click the photo at left to shop all our Cat Play Enclosures. Cats can get asthma and other breathing problems, too! Click the photo at left to shop the entire Feline Respiratory Care category. Can I take my cat hiking with me? Why should your cats stay home when they can go with you? Keep yours safe by taking a few precautions, and by cat-proofing your home and garden. Fortunately, there are some recreational safety products we offer that may help. Click the photo at left to shop the entire category of Recreational Cat Safety Equipment. Why is my cat always scratching the furniture? Cats need to scratch. It exercises their front legs, keeps their claws in good condition, and provides a sense of satisfaction. Buy kitty the proper scratching furniture...or the sofa gets it! Click the photo at left to shop the entire selection of Cat Scratching Posts. Can I put my cat in a cat show? Show cats need special supplies. Click the photo at left to shop our entire selection of Cat Show Supplies. Why does my cat have what looks like a rash? Feline acne, folliculitis, ringworm, flea dermatitis...there are many cat skin diseases. Fortunately, most are preventable or treatable. Once your vet has diagnosed the problem, we carry products to help you keep kitty's skin, coat, and paws in tip-top shape! Click the photo above left to shop the entire category of Cat Skin, Coat, & Paw Care products. Most of us who live with cats know that they're better at training us than vice versa. But if you'd like to try, we carry training aids to help you. With a little time, repetition, and patience, you may be surprised what your cat can do! Click the photo at left to shop our entire selection of Cat Training Supplies. What do I need to travel with my cat? Don't let your cat be the next one to make the news for getting lost in an airport. Travel safely and comfortably with your cats using some of the many fine travel products we sell. Click the photo above to shop the entire selection of Cat Travel Supplies. Why is my cat always climbing things? Cats need to climb, for the same reason they need to scratch. It's good exercise and enables them to get to high places, so they can look down on you. To save your window screens, curtains, and upholstered furniture, you'll want to provide kitty with at least one appropriate cat tree. We offer many styles to coordinate with any décor. Click the photo above to shop our entire selection of Cat Trees. Why does my cat pee on the carpet? Ah, if only your cat could tell you when it hurts to pee. Well, he does...but mainly by urinating outside the litter box. Help keep kitty's urinary tract functioning properly with appropriate supplements, hydration supplies, and healthy treats. Click the photo at left to shop our entire selection of Feline Urinary Tract Support products. Why does my cat always sit on my computer? Cats have a body temperature slightly higher than ours, so they get cold when we feel fine. But they can also overheat in weather that's hot and dry. Don't make them huddle together for warmth! Help keep them regulated with our cat warming & cooling products. Click the photo above to shop our entire selection of Cat Warming and Cooling Products. Will cats tolerate wearing clothing? Admit it, you like to dress up your cats. Why else would you be shopping on a site like this? We can help. While we don't offer fancy runway fashions like this cat's wearing, we do have several items your cat may actually allow you to put on her without tearing off your arm, along with cat-safe collars, harnesses, and leashes. Click the photo at left to shop our entire selection of Catwear. Is my cat overweight, or underweight? Obesity is a problem that can lead to many other health issues for cats. But underweight can also point to health issues. Keep kitty's weight in a normal range for optimal health. Click the photo above to shop our entire Feline Weight Control selection. Are there vitamins for cats? Much like us, our cats don't always eat right, and need some nutritional supplements. We carry a wide variety of them to keep your kitty in the best of health. Click the photo above to shop the entire selection of Cat Vitamins and Supplements. How can I prepare my cat for the upcoming holidays? Well, what do you know, a mixed marriage can work! Doesn't this pair look ecstatic? Cute outfits aren't the only way to celebrate the holidays with your cats. We have many others, along with calming products for busy holiday times throughout the year. Click the photo above to shop our entire Holiday Products for Cats area. Are there natural alternatives to drugs for my cat? If you'd rather not use chemicals to treat your cats and prefer a more natural, homeopathic, or holistic alternative, we have an array of products for you. Click the photo above to shop our entire Alternative Cat Remedies selection. What do I need to care for kittens? We have your kitten supplies. Because those babies need different things than grown-up cats, they have their own special section. Click the photo at left to shop our entire Kitten Supplies department. What can I do to help my older cat be more comfortable? Just like the kittens, senior cats need special care, too. So they also have their own special section. Cats are considered Senior by age 11, and Geriatric by age 15. Click the photo at left to shop our entire Senior Cat Supplies department. Is my cat going to die soon? It's always painful to say goodbye to one of our feline companions. There are things you can do to make kitty more comfortable, provide palliative care toward the end, and ease the transition. Click on the image at left to shop our complete Time to Say Goodbye section. • Catwear Collars for everyday wear, harnesses & leads for outdoor adventures, costumes for special occasions. C'mon, you know every Old Maid Cat Lady likes to dress up the cats! Just give in to the feeling and buy them something new. • Holiday & Celebration Time Cats love to celebrate holidays and special occasions, too! Here, you'll find cat scratchers, cat toys, catwear, and everything else you need to make your kitty's holiday the best ever! Not just for Christmas, either, so check back throughout the year. • Kittens Because kittens have special needs, Old Maid Cat Lady gives your precious babies a special section of our store! Here, you'll find kitten supplements, kitten food, litter training aids, heated beds, and all the other kitten care products to keep them well and happy. • Cat Meal Time Every old maid cat lady knows meal time is the most important time on the kitty clock! Here, you'll find all the cat food, cat dishes, and mealtime accessories you need. • Cat Nap Time All types of products to help your cat have sweet kitty dreams! Beds, condos, perches, and places felines can snooze. Some are even heated! • Play Time Sometimes your cats amuse themselves, and sometimes they need help! Here you'll find interactive toys, cat furniture, and plenty of environmental enrichment products to entertain your smart kitty. • Rescue Time Products for cat rescue groups and shelters, including carriers, crates, toys, litter supplies, cleaning products, and environmental enrichment items that help relax cats in the shelter environment and showcase cats available for adoption. • Senior Cats Your senior cats have special needs, so Old Maid Cat Lady gives them a special section of the store! Here, you'll find supplements, special beds and adaptations to make your senior kitty's life as long, healthy and comfortable as possible. • Show Time Because show cats are very special (just ask them), Old Maid Cat Lady has also given them a special section of our store! We have all the grooming, crating, transportation and other products you need to keep your show cats in tip-top shape. • Time to Say Goodbye It's inevitable that we must one day say goodbye to our cats. Here, you'll find palliative care products to ease the transition, as well as products to help your remaining cats grieve for your departed family member after the loss. • Training Time Think you can't train a cat? Think again! Old Maid Cat Lady offers all the products you need to teach your kitties to live the civilized life. • Travel Time When it's time to hit the road, Old Maid Cat Lady has all the supplies you'll need to keep Fluffy happy! Carriers, travel beds, calming supplements, cat strollers, muzzles...you name it, you can find it here. Click here to describe what you want. We'll do our best to track it down and offer it to you.